André Bauchant was born in Touraine, France, and lived most of his life in this small town between Tours and Blois. He was a good student, with a particular love for classics and geography. Although he left school at the age of 14 to work as a farmer, he continued to educate himself by reading history and mythology, traveling throughout France, studying architecture, maps and telemetry. This self-education is reflected in the historical compositions that Bauchant painted in the first decade of his artistic career. Bauchant served in the army during World War I, employed first as an accountant and then as a draftsman. He was a quick study, and was soon put in charge of charting and rangefinding. His experiences in the Army encouraged him, at the age of 45, to become a painter. After the completion of his military service, Bauchant returned to Touraine to work as a gardener and a horticulturist. 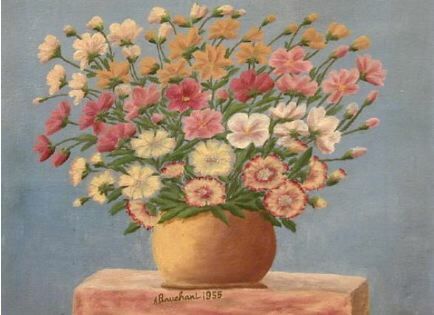 In his spare time he painted, filling canvas upon canvas with lush floral arrangements and vivid landscapes. He had works shown in Paris galleries through the support of the German art historian and dealer Wilhelm Uhde. Uhde promoted Bauchant, along with Camille Bombois, Séraphine Louis, Henri Rousseau and Louis Vivin, as one of the “Sacred Heart” group. These were the most important self-taught artists in early 20th century France.